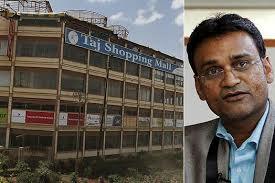 Sunday February 10, 2019-The owner of demolished Taj Mall, Rameshchandra Gorasia, has joined the contest for the Embakasi South Parliamentary by-election. Gorasia is eyeing the seat on a Democratic Party of Kenya ticket. Independent Electoral and Boundaries Commission (IEBC) officer issues clearance certificate to Rameshchandra Gorasia on Tuesday and gave him the nod to vie for the Parliamentary seat. Speaking after IEBC clearance, the business mogul said he is fit to represent Embakasi South people in Parliament. He exuded the confidence of clinching the seat in the coming by-election. He noted that the constituency needs a visionary leader to push the development agenda forward. “I confident that Embakasi South people will massively vote for me in the April 5 by-election,” he said. Gorasia is expected to battle out with other political heavyweights in the by-election among them Julius Mawathe, whose election was nullified leading to the by-election and former MP Irshad Mohamed Sumra. Gorasia blamed Nairobi Governor Mike Mbuvi Sonko and President Uhuru Kenyatta for demolishing his Taj Mall and now that he has joined politics, they will have him to contend with.